A fisherman wears a headlamp as he looks for small, transparent baby eels, also known as "elvers," in his dip net as he fishes at the edge of the Union River in downtown Ellsworth in April 2017. 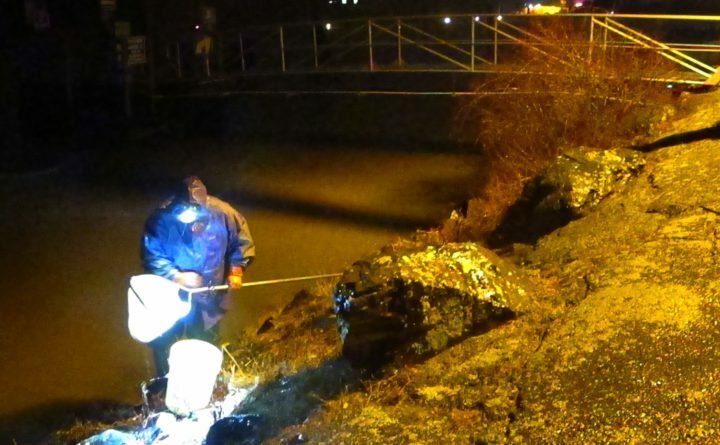 The state's lucrative annual elver fishing season, which last year netted $21.7 million in gross revenues for licensed Maine fishermen, is scheduled to begin this year on March 22. A year after eel fishermen in Maine earned their highest-ever pay rates for their catch, and as the global appetite for the snake-like fish continues to grow, the state’s annual baby eel fishing season is set to begin Friday. Despite the early closure, Maine’s approximately 1,000 licensed elver fishermen cumulatively earned $21.7 million last year for their efforts — a record total since the state’s annual harvest was capped in 2014 — thanks to a record average price of $2,366 per pound. There typically are between 2,000 and 2,500 elvers per pound. Heightened demand for eel has helped make trafficking of elvers to Asia from Europe, which bans such exports, a major criminal enterprise over the past decade — driven by “exploding Asian demand for a product viewed as both a delicacy and an aphrodisiac,” according to the Japan Times. In recent years, roughly 40 percent of the annual elver harvest in Japan, or nearly 6 tons, was poached, illustrating how the region’s demand exceeds the amount that are caught legally around the world, according to Nippon.com. Earlier this month, eel fishery experts told fishermen at the Maine Fishermen’s Forum in Rockport that demand for eel — much of which is served as unagi, a sushi dish — continues to grow, which is good news for the state’s elver industry. “People seem to be developing more and more of an appetite for eels,” said Kristen Steele, a Ph.D. student in England who has been studying eel fisheries in the U.S. and the United Kingdom. Sara Rademaker of American Unagi, who after incubating her aquaculture business in Maine for the past few years is now expanding to a commercial scale at a site in Waldoboro, said she expects global demand for eels to help her business expand. Eel farmers have yet to figure out how to breed eels in captivity, so Rademaker said she depends on Maine fishermen to sell her wild-caught elvers that she then grows out to market size. New rules that Maine dealers will have to abide by this year are aimed at making it more difficult to conceal illegal cash transactions and illegally purchased elvers from fishery inspectors. The changes prohibit more than one elver dealer from buying and storing elvers at the same physical address, and require dealers to unload and deliver all elvers on a transport vehicle whenever it arrives at a transfer facility. The purpose of these rules is to make sure that the volume amounts listed in a dealer’s transaction records matches the quantity that a dealer has in his or her possession, according to Jeff Nichols, a spokesman for the Department of Marine Resources. Dealers also are required to give the Maine Marine Patrol 48 hours notice of their intention to package shipments for transportation out of state and must make arrangements for a Marine Patrol officer to be present to monitor the preparation of the shipment. The Marine Patrol officer must seal the package and mark the package with both the weights of the elvers inside and of the overall package. The absence of any such seal, or signs that the seal has been broken or tampered with, could result in law enforcement seizing the package. Two Maine elver dealers have been charged as a result of the scheme uncovered last spring, but more people could face charges, according to Marine Resources Commissioner Patrick Keliher. Keliher said that before the scheme came to light, the Atlantic States Marine Fisheries Commission had seemed willing to raise Maine’s annual elver quota above 9,688 pounds, which is something fishermen and the state have been seeking for years. Without naming anyone, he suggested that fishermen keep that in mind this spring. “I would urge all of you to consider that when you are deciding which dealers to sell to,” Keliher said.